I didn’t start out looking for tales of family secrets. Or maybe I did. I miss my own family so much that everything seems to lead me to thoughts of them. Even the books I chose to read this week..
Sylvia’s first husband dies suddenly when they are still both very young, leaving her to raise their infant daughter, Eve, alone. Years later, she marries again. And after fourteen years together, she knows she has the perfect husband, even if he travels a lot and is so often unavailable to her. Even if he won’t let her go back to work, even if he’s obsessed with privacy, even if she doesn’t have a full time husband. Now that her daughter is about to head to college, Sylvie is looking for reassurance that he’ll be home more but he’s resisting. And it might have something to do with another family, Maggie’s family, soon to be Sylvie’s family too. Now what was it he said about his ex-girlfriend Maggie again? Oh, wait. He didn’t! The plot was interesting to a point. Looking back at the story is actually a little better than reading it. Some of the situations were really awkwardly engineered. The scene where Eve ends up in Maggie’s house. Seriously, what are the odds of that happening? There were also a few holes in the plot that remained unresolved even after the novel wrapped up – situations that were mentioned as though they would be important but never dealt with later. It feels like a couple chapters might have gotten cut from the novel without their details being reworked elsewhere. Mark’s financial and legal troubles left me scratching my head in confusion. The description of Sylvie’s mother, and the relationship Sylvie has with her saddened me. It seemed to have been handled brutishly, leaving me feeling cheated when she’s blamed for so much without an opportunity to redeem herself. Eve’s illness added a layer of complexity which I think the novel needed, although at times, it didn’t flow, which made me think it might have been added as afterthought. I was a Jane Green fan back when her characters were larger-than-life personalities like Jemima Jones. 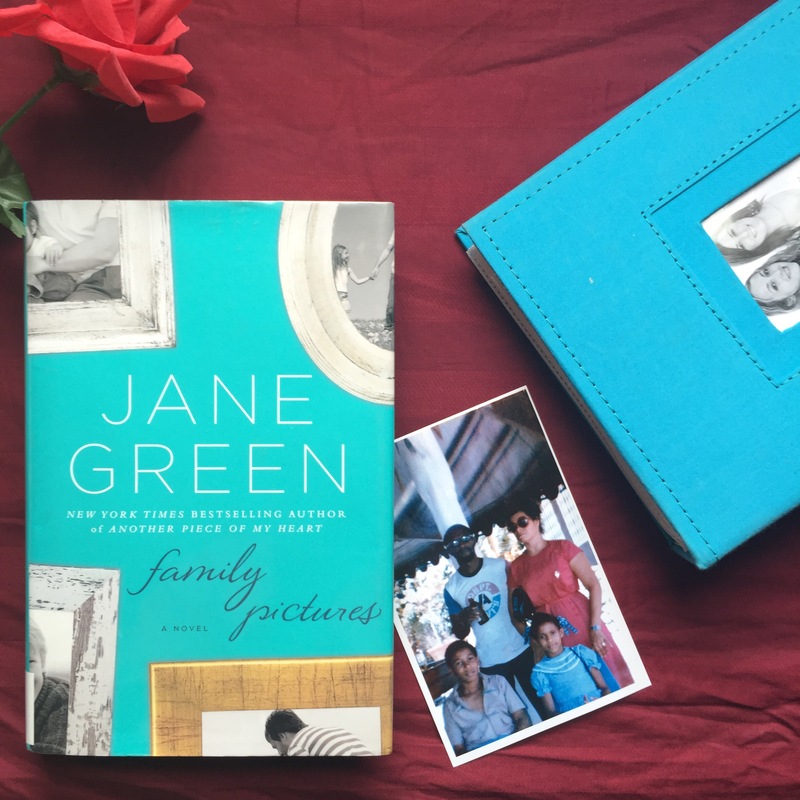 In Family Pictures, the female characters weren’t the strong but flawed women I expected. The craftsmanship was lacking. The writing was okay but not great. These made me wonder if Jane Green’s novels have gone the way of less-talented ghostwriters in a back room somewhere using a novel-writing formula. Which would be very sad indeed. Georgia’s family owns a winery in California’s Sonoma County. She has spent her entire life running away from life on a vineyard but suddenly, she finds herself in a wedding dress driving hundred miles towards the life she said she never wanted and leaving behind all the things she thought mattered. Except there are more surprises waiting for her at home. Just like it takes 800 grapes to produce a single bottle of wine, Eight Hundred Grapes is also a story of how many elements are needed to achieve the results we want in life. The people who help us most, are our family, biological or adopted. The themes are relationships, forgiveness, doing the right thing even when it’s hard. The family secrets were raw and shocking and messy but seemed real. This book made me yearn for time with my own family. 3. 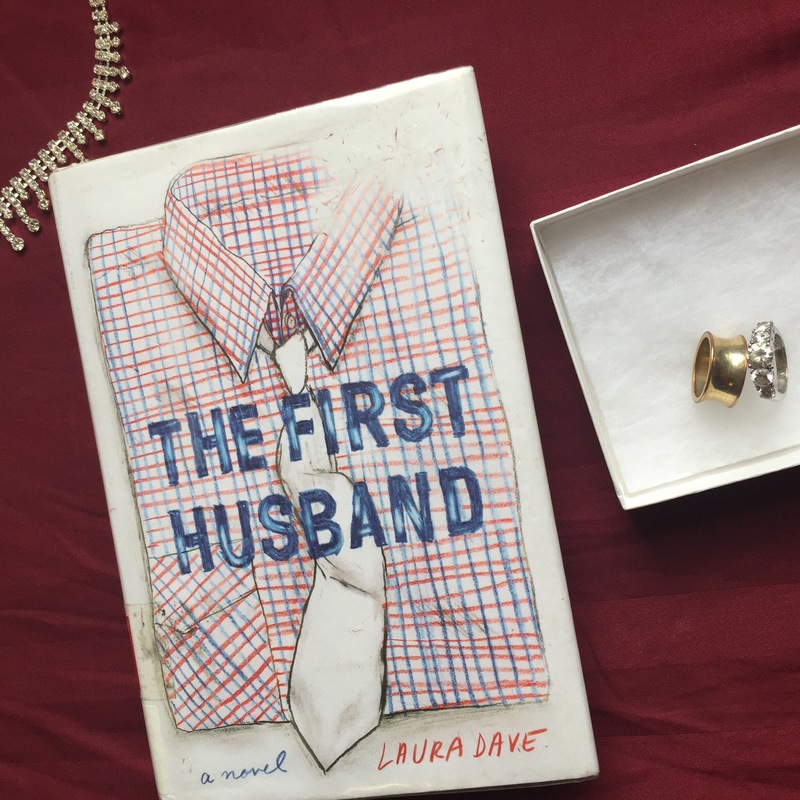 The First Husband by Laura Dave 244 pages rated 4/5 stars. Annie is a travel writer which means she always has an excuse for running. She is obsessed with watching Roman Holiday. But every time she watches it, something bad happens in her life. So then why does she keep watching it? Is she sabotaging her own life by choosing to see the same movie over and over? The title character, Annie’s first husband, is Griffin, the man she meets after Nick, her five-year boyfriend dumps her hours after watching the movie. Then she watches the movie again and loses her job. So why watch it again? And why, then, doesn’t she expect to lose the only thing she has left. I found the characters tragically familiar. Laura Dave shows angst really well and makes the flawed characters so lovable you want to root for them even stuck in their messy lives. It was hard not to compare The First Husband to Eight Hundred Grapes so I didn’t try to resist. A woman deciding between the man who she thought she would be with but who’s disappointed her, and the man who’s right here to rescue her from it. A single woman’s opportunity to inherit someone else’s ready made family. The impact family members have on relationships. I have a couple other Laura Dave titles on reserve in the library and will be adding to this comparison later. 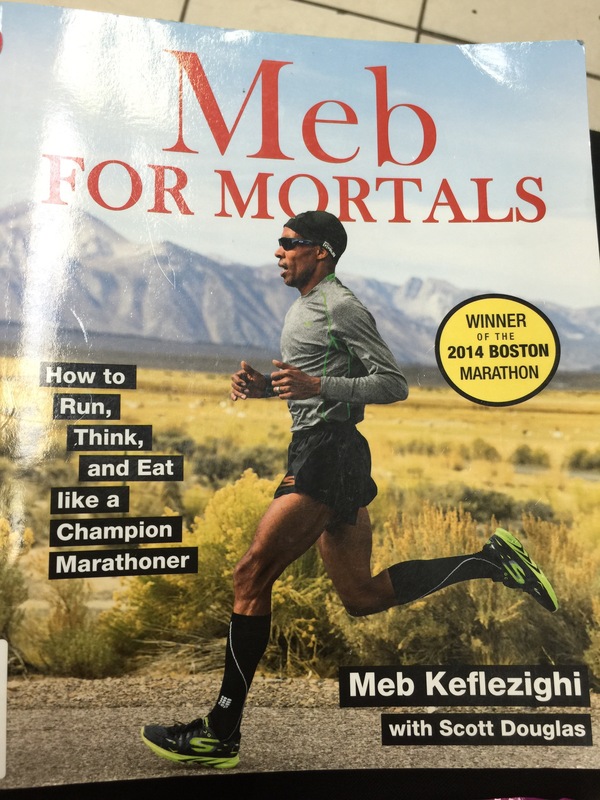 Currently reading Meb for Mortals to inspire my running which seems to have taken a backseat this summer. Do you go through phases where your books share common themes? Can’t believe you posted about The First Husband! You reminded me that I read that way back when it was first published. I remember liking it. 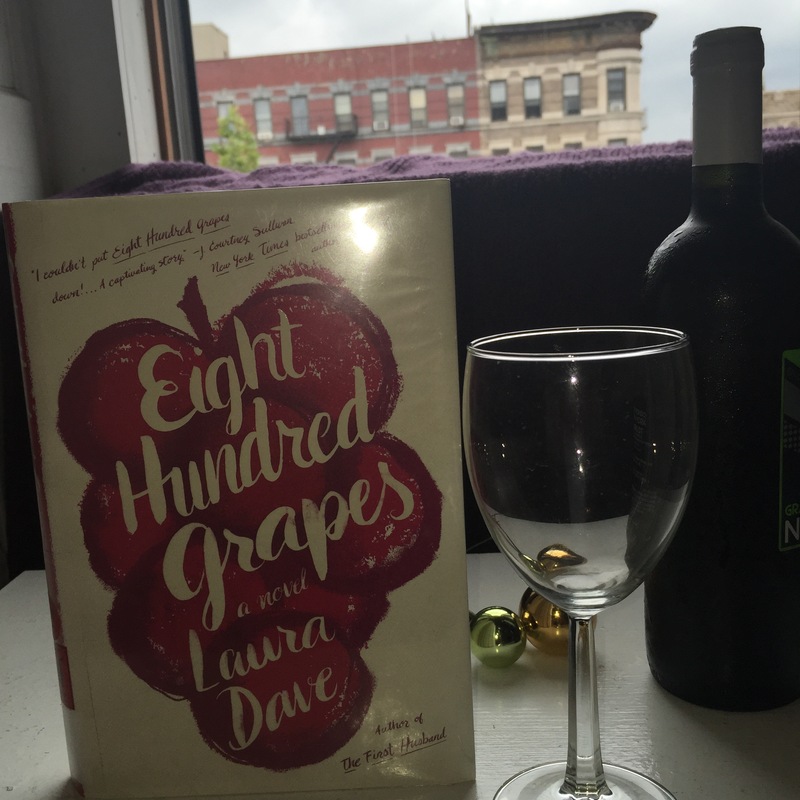 Eight Hundred Grapes has been recommended to me a lot lately…I have it on hold at the Library! !